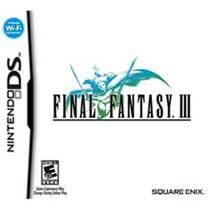 Finally, after eluding international release for nearly 2 decades Final Fantasy III has come over seas. Believe it or not this is the first time that the game has come across to North American shores officially. I say officially because it has been translated and ported through emulators by adoring, dedicated fans before. However the original release was on the Japanese Famicom (NES to us) back in 1990. 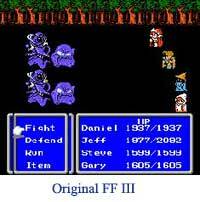 Many may confuse the real FF III with the North American FF III that was released on the SNES. That was in fact Final Fantasy VI. To confuse things even more Final Fantasy II for the Super Nintendo was in fact FFIV in Japan. The real FF II was not released until years later as a compilation pack called Final Fantasy Origins for the PlayStation 1. This means that we westerners were ghiped out of the real FF II, FF III, and FFV. Now 17 years later, all original Final Fantasy tittles have come over seas and are now named correctly! Final Fantasy III set precedent for so many reasons. It was the first game to use the now famous Job changing system that has become associated with the series. 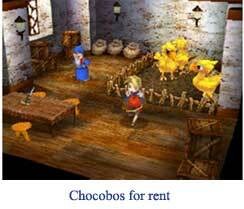 It was also the first game to feature Job specific commands such as “steal” for thieves and “defend” for knights. Summons also made their first appearance in FF III. Looking at the DS version, one can really appreciate old school RPG nostalgia. It was a time of smaller towns and simpler stories. Final fantasy III to me is an exciting discovery and rediscovery of everything I once loved in old school 2D RPGs. The story is less grand than today’s FF epics. But with the updated cinematics and character development, the game really shines. The story follows 4 young orphans who are brought together by fate. The balance of the world has come undone and is shifting towards darkness. These 4 young heroes are chosen by the 4 elemental crystals to help rebalance the world between light and dark, bringing back natural order. The game is incredibly beautiful with art direction done by Ryosuke Aiba of FF XI fame. Everything is now in full 3D including the characters, but the graphics are ultra cute and super deformed paying homage to earlier games of the series. Akihiko Yoshida who did the character designs for FF XII stepped up and did a wonderful job on our 4 young heroes and their job specific counterparts. 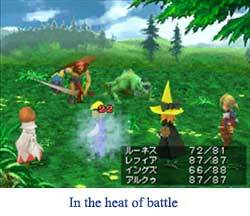 The music throughout the game is classic Final Fantasy as well. Battle melodies and town tunes stay true to the original. There is also Mogmail, so you can send emails to your friends who also own the game over WiFi. It should be noted that using Mogmail is essential for unlocking all of the ultimate Job specific items (best items in the game). So start sending mail via the Mogmail! I loved navigating the heroes with the DS’s touch control scheme, because it had a very fluid feel to it. Although the game is an old school turned based RPG, touching your selections and targets with the stylus during a battle felt so natural and comfortable. 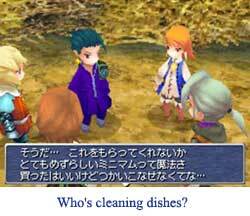 So much so that I think Square-Enix should remake all the original Final Fantasy’s again for the DS. Although Final Fantasy III is not as large or expansive as most of the games later in the series it is the most beautiful remake thus far. To those who don’t think it is as deep as the others; I say the 23 different Job classes will keep you busy for quite a while. There is a lot of work that goes into making the perfect party, but in the end the perfect party is the one you enjoy fighting with the most. Finally to Square-Enix, thank you, thank you for finally completing my Final Fantasy experience. Not only do I feel complete but my collection does as well.